We just got through day 13. I'm suffering from umbrella fatigue. Yes, it's been the 13th day of continuous rain in Sydney; from drought to drenching, the pendulum does swing both ways. And I guess now it's official, autumn is here, and I have to say a begrudging thank you for making it so obvious that you've arrived. Say hello to soaked hems, muddy feet and one constantly wet dog. I'll just try to think of it as one less bath I have to give him. 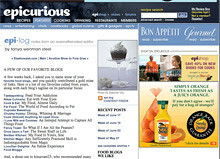 I know posting on the blog has been quite scanty of late, must be that crisp autumn air forcing me into hibernation. But the advantage of this is that my motivation for baking grows even the more as the weather gets colder. Keeping those oven fires burning is one way of staving off the chills. Sydney houses, are notoriously known for not being able to stand up to the colder months. Many overseas friends living here who come from much colder climes always gripe about the inadequate amount of insulation in our houses. And coupled with the lack of central heating in most homes, it makes the winter months even more unbearable. Our comparably mild winter probably doesn't warrant builders making houses with central heating a standard thing, but no matter where you're from cold is cold, especially at 6am when the dread of getting out of bed to take a shower overcomes you. I guess keeping the oven on is one way to get around this minor setback. I made these cakes earlier this month but decided to give it an encore appearance at around day 7 of our marathon rainfest, while holed up at home just watching the spate of storms come and go. 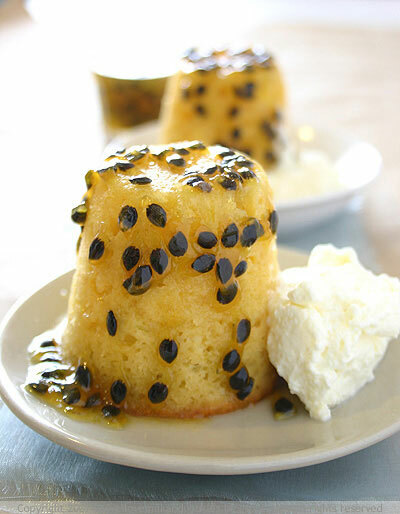 It was either build an ark or bake a cake and seeing as I was sitting on a pile of passionfruit, I made some cakes. If I was going to go down in a deluge, I might as well go down with cake. With my priorities in the right place, I spent the better part of a day baking. With no central heating in our house, Jack (the dog) and I spent the rainy afternoon in front of the blazing oven, our makeshift fireplace. I'm sure he spends his time loitering around the oven just in case a rouge piece of food happens to accidentally fall out and magically land in his strategically poised mouth. 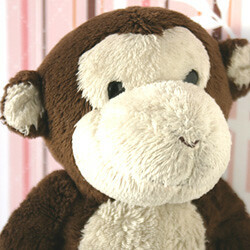 He's quite the optimist, but it's still nice to have his company, no matter what the motives. He likes to think of himself as the sous chef, although most of the time he's more like the cleaner, mopping up spilled ingredients. He doesn't mind. 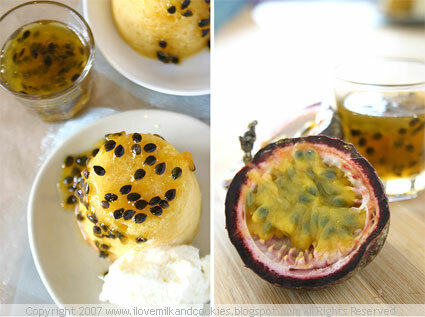 Right now, passionfruits are ubiquitous, so there's every reason for you to buy a whole lot. Here in Sydney we get the smaller round and wrinkled variety that have that distinct deep purple colour. They look quite strange and unassuming on the outside, and they weigh almost nothing but once you cut through that purple woody exterior there's a wonderfully rich and intensely brilliant daffodil yellow pulp inside. By itself the pulp can be a little too tart to eat, but ripple a few spoonfuls through some vanilla ice cream or yoghurt and you have yourself a killer dessert. And if you are familiar with the Australian picnic staple, the pavlova, then you know that it's the passionfruit that gives it its bite. The cakes are actually lime flavoured, but only subtlety. 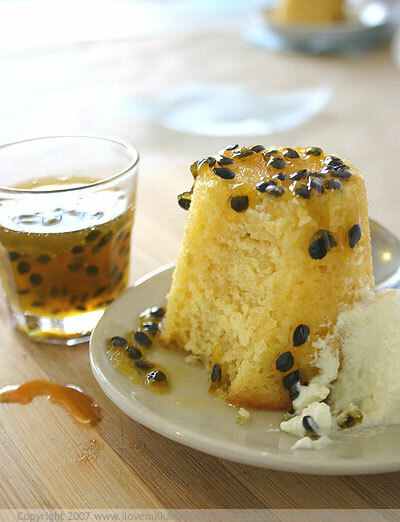 The passionfruit syrup is what gives the cake its kick. And like many other tangy fruits, a little bit of sugar takes this a dish a long way and livens it up a bit more. 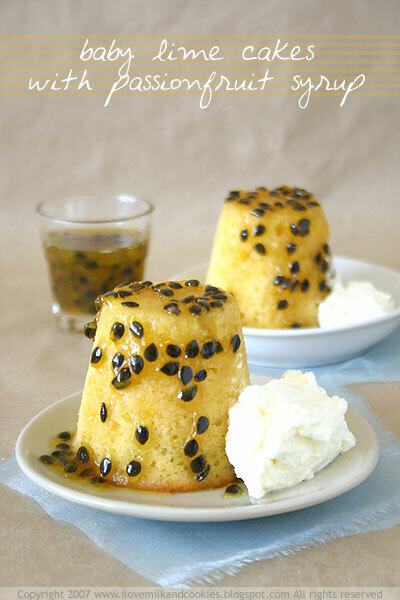 Add a dollop of whipped cream and you have all the insulation you need to get through a rainy day. Beat butter, sugar and rind using an electric mixer until light and fluffy, add eggs and beat to combine, then add sour cream or yoghurt and beat to combine. Fold in flour, then spoon mixture among 8 greased and floured 150ml-capacity dariole moulds and bake for 15 minutes or until golden. Cool for 5 minutes then turn onto a wire rack to cool completely. For syrup, combine all ingredients and ¼ cup water in a small saucepan and stir over medium-high heat until sugar dissolves, then bring to the boil and simmer for 10 minutes or until syrupy. Makes about 1 cup. For cream, combine ingredients and whisk until soft peaks form. 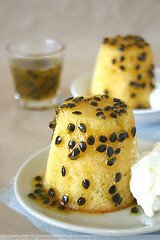 To serve, pour half the warm syrup over cool cakes and serve with passionfruit cream and extra syrup passed separately. Don't be alarmed, I am still alive. Although, I've been experiencing the giddy highs related to the consumption of too many Adriano Zumbo pastries. As cramped and as hole-in-the-wall his shop may be, people flock and people queue, in single file, just to be able to get to the front of the line to tell that person behind the immaculately styled glass counter what fares you are after. Usually it's a little piece of this and that, or perhaps a splurge on a decadent Zumbo dessert or a handful of macaroons if your budget will still allow. Walk too fast and you will almost miss it, that narrow, unassuming little piece of real estate on Balmain's Darling St. Walk too slow and you might not get there in time as the place is almost always cleaned out before close. You might be stuck with a quiche or a plain brioche if your not hasty, not that these aren't worthy, but the real spectacle are his speciality desserts, tarts and macaroons that change every now and then. The stuff way down the back of the shop, that's what the mob's all after. 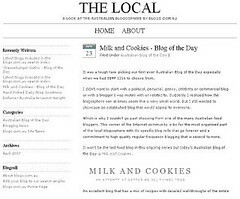 I've long been touting Balmain as a food lover's mecca, pastries, breads, butchers, cafes and gourmet stores line it's main street and it's a wonder why they have only just decided to capitalise on all its gastronomic potential. I could literally eat my way through Darling St, and this week you are actually encouraged to. The Balmain Rozelle Food Week starts tomorrow the 21st of April until the 27th of April, so if you are lucky enough to be in Sydney, then head over down Victoria Rd or over the Anzac bridge and make your way down Darling St, sampling the finest fare these providores have to offer. If you are interested in this event then download the whole program by clicking here. 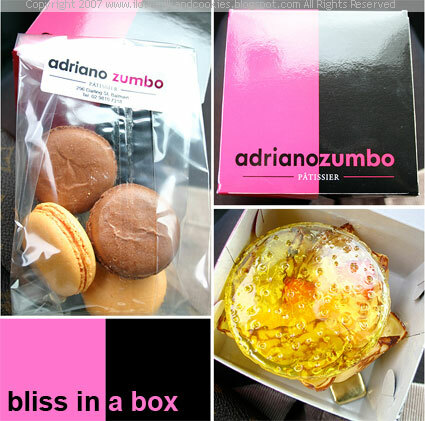 And in case you were wondering what I got from Adriano Zumbo, there were the mandarin and chocolate macaroons. Worth their weight in edible gold leaf, oh boy were they good! And a Miss Marple, which is a crepe shaped into a cup filled with mascarpone creme, strawberries, oranges and some Grand Marnier topped with a glorious sugar lid. It's art you can eat. 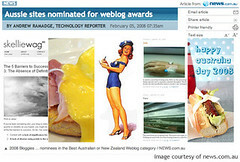 Have a great week guys and and I hope to be back blogging with something almost as delicious very soon. There's been a chill in the air of late. Autumn is well and truly here and although summer may well be done and dusted, some of it's late harvest has decided to stick around for a farewell party. Yes, stone fruits are something to look forward to come summer, but there's always enough left behind to tide you over till the beginning of autumn. In a last ditch effort to relive summer days, I suggest getting stoned. Of course I'm not talking about sparking up a doobie and getting fried, but rather enjoying the last that summer has to offer in its stone fruits. I'm having summer weather withdrawals right now, seeing that we never really got to have a proper one on the east coast. So this was my way of sparking up some lost memories of summer. And really, what's a summer without a peach? The quintessential image of biting into a ripe one, its juice dripping from the corners of your mouth, can make up for all the lucklustre weather we have had for months. They said it was going to last till March and it certainly did, and it looks like we just sailed right into autumn without even the slightest bump. Maybe there was the odd lightning crash and tree falling on one's roof, but other than that, as far as I'm concerned we've been in autumn since December. 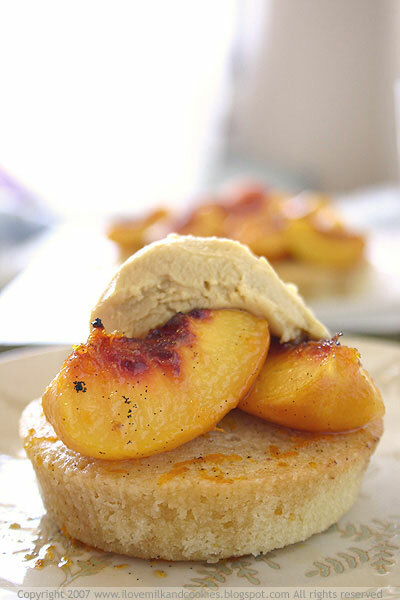 So this is my long overdue swan song for the summer we never had- almond cakes topped with roasted peaches. There's only one way to bid her farewell and it's with the best she had to offer. So rosy blushed peaches was an appropriate choice for a goodbye offering. I actually made this a few weeks back, although never had time to blog about them for a while. I found the peaches at the Entertainment Quarter Farmer's markets going for a song and couldn't pass them up. Then I happened upon a recipe for Almond cakes with roasted apricots on the Australian Gourmet Traveller website, and you know when you see a recipe that you simply must have right now, well that sheer impulse overcame me and I was bent on making this that very same day. I'm sure the droolworthy photograph on the AGT website helped in stoking the urge for them right away. Seeing as I didn't have apricots but had a heap of cheap peaches lying around, well, you know what I did. When life gives you peaches, you can decide to make a cake. 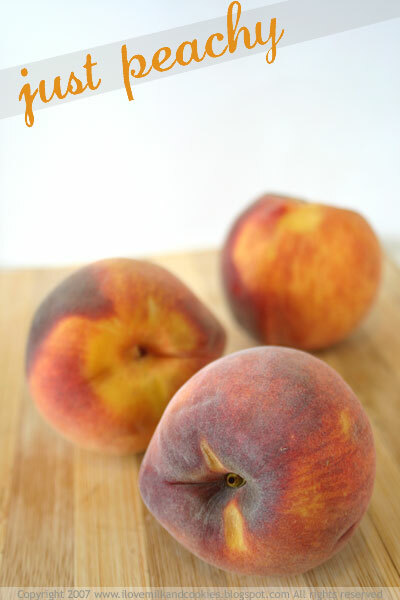 Peaches, like many other stone fruits, roast very well and there's very little you can do to improve on its flavour. So you might as well stick to the basics, a little sugar and little bit of booze and you have yourself a top notch dessert. It's amazing what wine does to a syrup. The booze of choice for this fare was a Seppelt Rutherglen Tokay that we bought on our last trip to the Hunter Valley- a sweet, honey flavoured dessert wine that was ideal for a fruit based dessert. I have to say that the almond cakes didn't turn out as dark as they were pictured on the website, so I was a little worried I had made a mistake. But after tasting the cakes, there wasn't anything to worry about. Not sure why there was a lack of colour, but at least it wasn't lacking on taste. Two thumbs up for this recipe and perhaps a better and less illegal way of getting stoned. 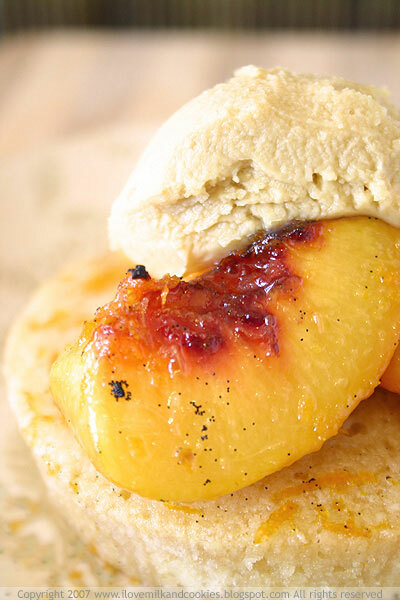 Using a blowtorch, scorch the peach skins until they blister. They should peel off easily. Combine sugar and vanilla seeds in a bowl and scatter over the base of a roasting pan large enough to hold peaches snugly. 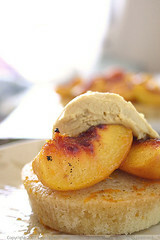 Place peaches, cut-side down, in a single layer in pan, pressing into sugar. Turn peaches and scatter over orange rind. 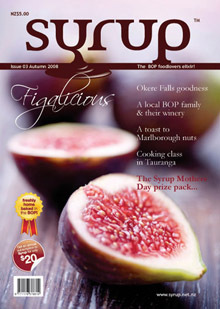 Combine wine, orange juice and 2 tsp orange blossom water in a jug and pour around apricots. Roast for 10 minutes or until just tender and golden. Set aside to cool, then, using a slotted spoon, remove 4 peach halves from syrup and process using a food processor until smooth. Set aside. 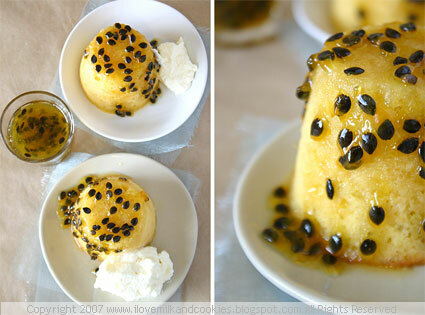 For almond cakes, reduce oven to 170ºC. Combine dry ingredients and rind in a bowl, add eggwhite and fold through until just combined. Add butter, stir to combine, then divide among six shallow pie moulds, smooth tops and bake for 15 minutes or until golden and centre springs back when lightly pressed with a fingertip. Cool in pans for 5 minutes, then turn out onto a wire rack placed over a tray. 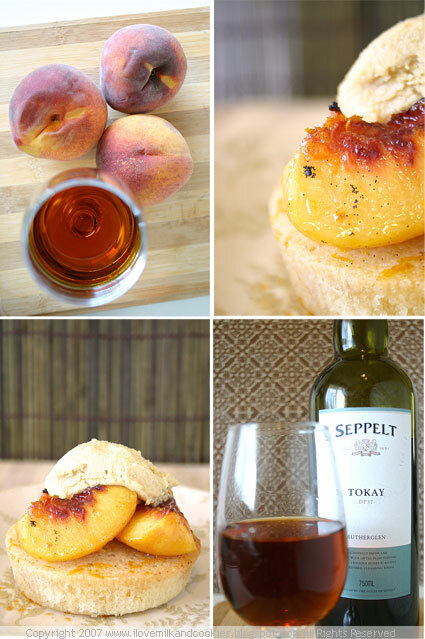 Spoon a little apricot syrup over cakes and cool completely. Combine crème fraîche, brown sugar and remaining orange blossom water in a bowl and whisk until thick and smooth. Fold through apricot purée to form a ripple effect. Top each cake with 2 apricot halves and a generous dollop of fool. Serve with syrup to the side.